Mexico City is widely considered to be one of the most unique capital cities in the world. Since the years of the Mexica people’s founding and Hernan Cortes’s later conquest, the city began its dramatic increase in size and population. The city is nestled in the middle of the Valley of Mexico, surrounded by two volcanoes at an altitude of more than 2,000m above sea level. The city’s general population of more than 8 million and metropolitan population of more than 21 million makes it one of the most populated megacities in the world. However, an increasing population means more traffic and air pollution, which not only affects the city’s population, but also damages its environment. A tool used to measure the air quality in Mexico City, known as the metropolitan index of air quality (IMECA), measures six types of harmful particles suspended in the air, including sulfur dioxide (SO2), ozone (O3), carbon monoxide (CO), nitrogen oxide (NO), and particles smaller than 10 micrometers (PM10). The IMECA scale ranges from 0-500 points. Any measure between zero and 100 IMECA points represents little or no health risks from air pollution, 101-200 IMECA points represents a threat towards the people of the city’s metropolitan area, and anything above 200 points poses an extremely serious problem that can result in severe health problems, and citizens are advised to stay indoors at all times. Concerns over air pollution were first raised in 1987 when it was reported that thousands of birds were dropping dead mid-air from the sky. In the winter of 1989, the situation worsened, when 400 IMECA points were registered. It was estimated that IMECA points began to increase by 41 percent between 1990 and 1991. The pollution was so bad that the United Nations declared Mexico City the world’s most polluted city in the early 1990s. Contingency plans were declared 12 times in 1993, when air quality levels reached more than 380 IMECA points, resulting in implementations of strict environmental measures. Since 1997, the city’s left-leaning mayors launched various programs to reduce harmful emissions by modernizing the use of public transport systems and encouraging the use of bicycles. As a result, Mexico City’s air quality has somewhat improved in recent years. For the first time in 14 years, Mayor Miguel Ángel Mancera has implemented the environmental contingency and the Hoy no Circula program. Factors contributing to Mexico City’s smog problem are both manmade and natural. Because the city is positioned at a high altitude, the atmospheric oxygen levels cause incomplete fuel combustion in engines, leading to high emissions of the harmful particles listed above. Intense sunlight magnifies the impacts of these emissions—the smog prevents the sun from heating the atmosphere enough to penetrate the inversion layer, which climate scientists define as an atmospheric layer in which temperature increases with height that covers the city. In other words, the smog usually gets trapped in the valley that surrounds Mexico City and has difficulty spreading into different areas. Furthermore, according to the Tom Tom Traffic Index, Mexico City ranks as the most congested city in the world, with a congestion level of 59 percent, surpassing Bangkok, Istanbul, Rio de Janeiro, and Moscow. The 2014-15 National Report of Urban Mobility in Mexico estimated that automobiles generate 18 percent of carbon dioxide emissions within Mexico City. There are a total of 5 million vehicles in the city, where vehicle presence has increased to an annual rate of 3.8 percent. The rate of harmful emissions per vehicle depends on its age. Generally, the older the vehicle, the more harmful chemicals it emits. About 29 percent of the population uses cars as their primary means of transportation, whereas 60.6 percent uses microbuses, taxis, and combis (minibuses), and eight percent relies on trolleybuses, metro, and metrobuses. Finally, 2.4 percent relies on bicycle and motorcycle transportation. The poor quality of air in the region threatens the lives of every resident in Mexico City. These harmful particles emitted into the air end up causing illness. The most vulnerable are children, the elderly, and those with breathing conditions like asthma. Common symptoms of pollution-related illness include headaches and irritation of the lungs, eyes, and throat. Air pollution can also worsen cardiovascular and respiratory-related diseases and thus can cause premature death. About 80 percent of premature deaths related to air pollution are linked to coronary artery disease and heart failure, 14 percent by acute respiratory infections, and six percent from cancer. In 2010, it was estimated that a total of 14,000 deaths were related to pollution. The Organization for Economic Co-operation and Development (OECD) also predicted an increase to 21,000 deaths in 2030 and 42,000 deaths in 2060 if the problem is not addressed appropriately. According to Horacio Riojas Rodriguez, head of the National Institute of Public Health (INSP), approximately 20,000 people die from air pollution every year in all of Mexico—9,600 of these deaths are reported in the Metropolitan area alone. The Hoy no Circula program (“no ride today”) is intended to ban certain cars from driving in the city for one day and one Saturday a month. The ban on cars varies by color and the last digit on the car’s license plate. Some obvious exceptions include police cars, ambulances, electric and hybrid cars, and school buses. The program was first introduced in November 1989, when pollution levels were increasing at alarming rates. Its original objective was to reduce vehicle flow by one-fifth. Many people have complained about the efficiency of the program in its efforts to reduce gas emissions. Although the traffic flow may have decreased, microbuses are often blamed for being dirty, old, and emitting more pollutants than regular vehicles. Even though the government has recommended the use of public transportation, it is not a safe option for many residents. According to the World Economic Forum, Mexico City’s public transportation is ranked as the second most dangerous in the world for women, due to rampant sexual harassment. In other words, if the safety of the passengers using public transportation is not handled appropriately, then it is more likely that residents will turn to private cars for transportation. According to chemist Luis Manuel Guerra, one of the main problems of Hoy no Circula is the fact that the actual legislation allows for the flow of more than 600,000 vehicles in Mexico City. People who are situated in a better economic position often choose to buy a second car for the days that their cars cannot operate. At this point, about 90 percent of pollution comes from private vehicle traffic, while 10 percent comes from the imposition of transit laws that produce congestion. Another major contributor to mass emissions is cars with expired catalytic converters, which emit 35 times more than those in optimal conditions. Catalytic converters have a lifespan of six years and legally must be replaced once they stop working. However, this policy has not been fully enforced: about 25 percent of the city’s cars have catalytic converters that are more than 16 years old. Unfortunately, these vehicles are responsible for generating 80 percent of the contamination in Mexico City. While old cars and factories are blamed for releasing harmful emissions in the city, many people accuse corrupt politicians of not taking the pollution crisis seriously. Institutional corruption impedes efforts to reduce harmful emissions in several ways. First, when old cars pass through inspection centers, the owners of these cars often give mordidas, or bribes, to the administrators in order to pass the emissions test. Second, the old buses serving as public transportation are privately owned and are not subject to ecological regulations. Additionally, the transportation leaders have been engaged in illegal agreements with government officials with the intention of avoiding restrictions. Third, the new traffic laws that went into effect in December 2015 reduced the speed limit in the streets in order to reduce emissions. However, researchers at the National Autonomous University of Mexico (UNAM) stated that these new norms make vehicles consume more fuel and worsen traffic, thereby increasing volume of emissions. Finally, various attempts at environmentally-friendly options have not reached their full potential. One example is the inauguration of a new metro line in 2012, which transported 400,000 passengers daily while in operation. Less than two years later, however, it was closed due to structural difficulties that compromised the safety of passengers. The whole project was worth $1.5 billion USD, 70 percent more than the intended budget. 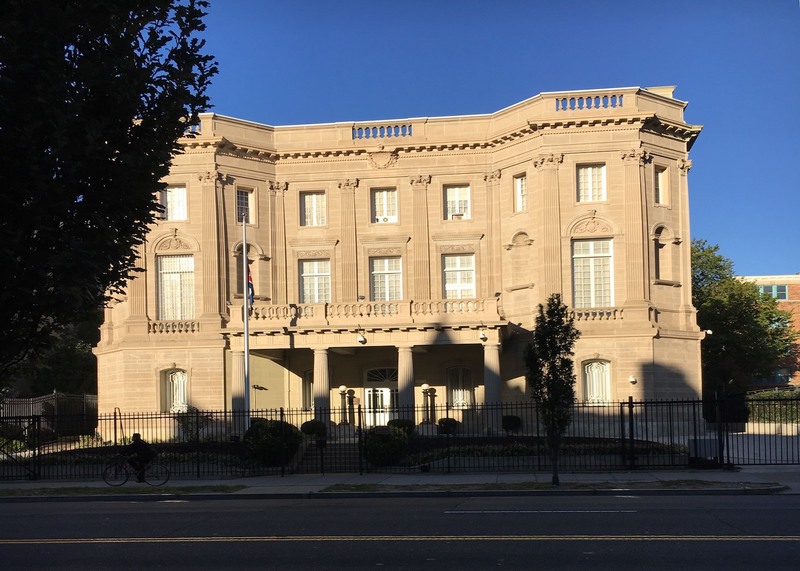 The ex-director of the project, and now political fugitive, Enrique Horcasitas, was accused of authorizing payments from a private company for a failed construction project. It is obvious to the citizens of Mexico City and the Valley of Mexico that the government’s efforts have done little to solve the smog problem. The government must come up with innovative ideas that can lower emission levels from car traffic and the circulation of old vehicles. According to the New York-based Institute for Transportation and Development Policy, the Mexican government must spend its money wisely because currently, three quarters of transportation investment in urban areas is spent on road maintenance and expansion. Although environmental policies have been proposed to fix the problem, there is no guarantee that they will be put into effect. For example, the environmental commission could consider adding 1,000km to the Bus Rapid Transit (BRT) network. Even though the World Bank may lend 3 billion pesos ($170 million USD) for public transportation networks nationwide, including the extension of a BRT line, the matching cost for the government would total 40 billion pesos ($2.2 billion USD) annually, a number which neither the federal government nor the city can afford. Francisco Barnés of the Centro Mario Molina has proposed the extension of the BRT network on the busiest routes and the replacement of the dirty buses with cleaner ones in the less popular routes. Though increasing parking meters and congestion charges might sound like good ideas, commuters and bus-owners would likely resist such reforms. During the past years, city authorities have taken major steps by implementing recommendations made by the Air Quality Management Plan in order to reduce emissions. Among the recommendations were: imposing tougher emissions control standards for new cars; improving fuel quality to introduce new vehicle technologies; enforcing a strict and technically sophisticated Vehicle Verification Program for semi-annual inspection of catalytic converters; increasing public transportation usage and improving quality of service and personal safety; providing low-interest loans for traffic substitution; and constructing roadways and other transportation infrastructure. While all of these proposals are excellent ideas for reducing Mexico City’s harmful emissions, it is up to the government to enforce these proposals and promote transparency. An additional measure to address the issue is through education regarding the causes of air pollution. This would allow citizens to contribute to the government’s efforts to tackle emissions. As one of the biggest and most populated cities in the world, Mexico City should strive to change its reputation. Overall, the lack of municipal government enforcement is likely at fault for the delay in the reduction of air pollution. As a country that agreed to reduce greenhouse gases at the 2015 Climate Summit in Paris, Mexico should implement better policies against emissions not only in its capital city, but also in the rest of the country to improve the quality of life for the Mexican people. Featured photo: Mexico City. Taken from Wikimedia. Ezcurra, Exequiel. Que Mide La IMECA. Publication no. 22. Facultad De Ciencias, UNAM. Spring 1991. http://www.revistacienciasunam.com/pt/170-revistas/revista-ciencias-22/1537-¿qué-mide-el-imeca.html. Sanchez, Cinthya. “Smog: Viejo Enemigo De La Ciudad.” El Universal. 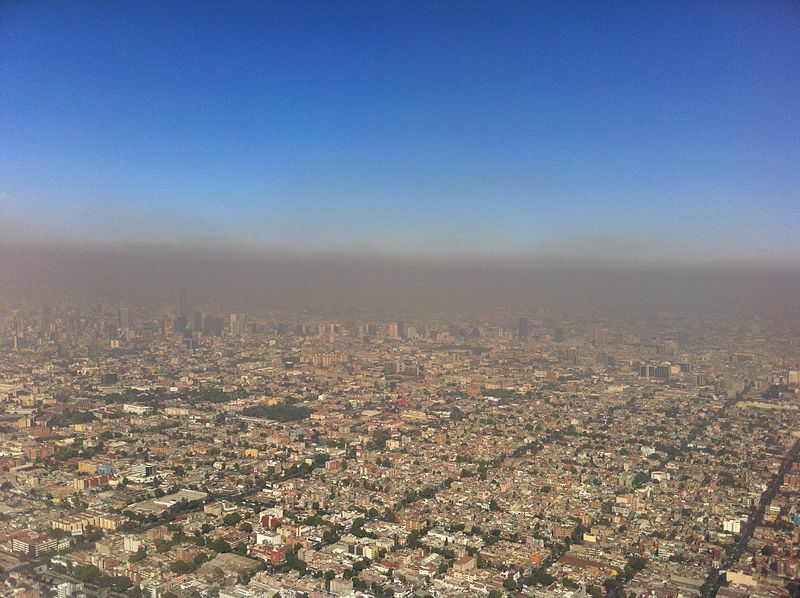 June 28, 2013. http://archivo.eluniversal.com.mx/ciudad-metropoli/2013/smog-viejo-enemigo-de-la-ciudad-938785.html. Sole, Carola. “More Cars Banned in Mexico City after Pollution Alert.” Phys.org. March 16, 2016. http://phys.org/news/2016-03-cars-mexico-city-pollution.html. Hibler, Michelle. “Taking Control of Air Pollution in Mexico City.” IDRC. August 4, 2011. https://www.idrc.ca/en/article/taking-control-air-pollution-mexico-city. “La Contaminación Ambiental En La Ciudad De México: Todo Sobre La Contaminación Del Aire.” Propiedades (blog), April 19, 2016. Montalvo, Tania. “Contingencia Ambiental En El Valle De México: Así Daña Tu Salud Lo Que Estás Respirando.” Animal Poltico. March 16, 2016. http://www.animalpolitico.com/2016/03/contingencia-ambiental-asi-dana-tu-salud-lo-que-estas-respirando/. “Contaminación Del Aire Causará La Muerte Prematura De 21 Mil Mexicanos En 2030, Alerta La OCDE.” SinEmbargo MX. June 11, 2016.. http://www.sinembargo.mx/11-06-2016/3053128. “Contaminación Del Aire Provoca 20 Mil Muertes Al Año.” Excélsior. April 23, 2016. http://www.excelsior.com.mx/nacional/2016/04/23/1088374#view-1. “Hoy No Circula, Una Medida Con 27 Años De Historia ” Economiahoy.mx. April 06, 2016. http://www.economiahoy.mx/nacional-eAm-mx/noticias/7472740/04/16/Hoy-no-Circula-una-medida-con-27-anos-de-historia.html. “Transporte De México, El Segundo Más Peligroso Para Mujeres.” Forbes. November 02, 2014. http://www.forbes.com.mx/transporte-de-mexico-el-segundo-mas-peligroso-para-mujeres/. “‘Corrupción Provocó Contaminación En Ciudad De México’: CONACYT.” López-Dóriga Digital. April 06, 2016.. http://lopezdoriga.com/nacional/corrupcion-provoco-contaminacion-en-ciudad-mexico-conacyt/. Segarra, Paulina, and Ajnesh Prasned. “Como La Corrupción Perjudica Los Esfuerzos Por Reducir La Contaminación Atmosférica En La Ciudad De México – Ciencia Latinoamericana.” Latin American Science. May 16, 2016 http://latinamericanscience.org/spanish/2016/05/como-la-corrupcion-perjudica-los-esfuerzos-por-reducir-la-contaminacion-atmosferica-en-la-ciudad-de-mexico/. “Blocking Traffic.” The Economist. May 07, 2016. Accessed June 20, 2016. http://www.economist.com/news/americas/21698258-clean-up-its-air-capital-has-spend-more-money-more-intelligently-blocking-traffic. J. Molina, Mario and Luisa T. Molina. 2004. Improving Air Quality In Megacities: Mexico City Case Study. PDF. Cambridge, Massachusetts: Massachusetts Institute of Technology. p.7 http://peace-foundation.net.7host.com/Peace/file/Mexico%20City%20Project%20-Molina.pdf. “Los Culpables Y Las Soluciones Para El Problema De La Contaminación Alta En El Valle De México.” Animal Poltico. April 05, 2016. http://www.animalpolitico.com/2016/04/8-culpables-y-8-soluciones-al-problema-de-la-contaminacion-alta-en-el-valle-de-mexico/.